Saturday 10/5/13 Kenpo Tournament Fillmore! Farhan started with AASD in December of 2010. Farhan started as a little dragon and now has not only progressed to the Junior Dragons, but is a member of the Black Belt Club as well. Farhan enjoys classes with his older brother Rayhan, and the competition sometimes is fierce. 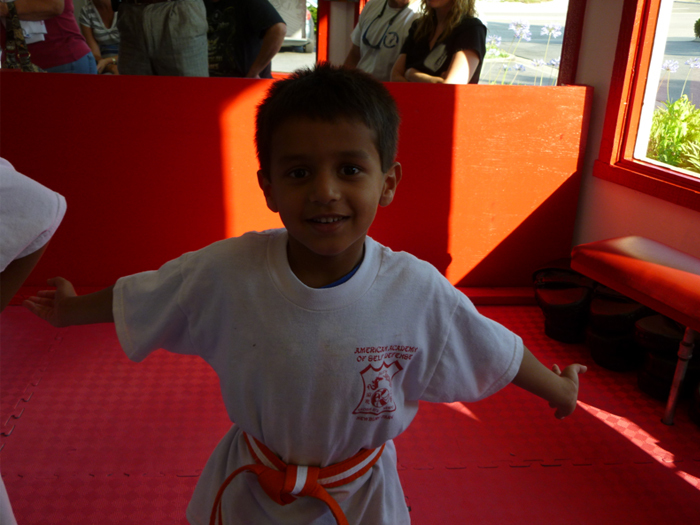 Farhan enjoys all aspects of Martial arts, and has mastered some of his basic kicks to an art. Always giving 100% and then some in class, Farhan can always be counted on to excel even when tired. Sifu Rick & staff wish to thank Farhan’s parents , (Irfan & Amina) for all their support of not only Farhan, but of our black belt school as well. Promise-keeping means making worthwhile promises that you are able to keep, and then you actually do keep. You make promises—we all do—but, for various reasons, too many of those promises are not kept. To be a great person, you must fully understand the importance of keeping promises and recognize those situations where making a promise is appropriate. There are many types of promises: Silly promises, bad promises, good promises and promises about situations that are beyond your control. When you understand these different types of promises, then you can improve your ability to keep promises. A silly promise is when you promise someone one million dollars for some object, for example, and you don’t have one million dollars. A bad promise could be promising to lie for a friend to keep him or her from trouble, or helping someone cheat on a test. A good promise is best defined as having an honorable or worthwhile objective, such as completing your chores when asked or returning borrowed money. Promises beyond your control include a promise that it will not rain next week, or that you will catch a ball during the game that would have a home run. It is important to use common sense when making and keeping promises. You may find yourself making promises that you know are silly, bad or beyond your control, but you make them anyway. Pay attention to the different types of promises you make, and when they are silly, bad and beyond your control, begin to eliminate them. Only then, will you begin to master good promise-keeping. Often, the most difficult part of good promise-keeping is the desire, the motivation, to take the actions required to keep the promises you make. To learn the action part of promise-keeping, make a list of all of your recent good promises, which you haven’t kept. Write next to each promise the action you will take to keep your promise—and then go do them! With this exercise, you’ll start to make only good promises, and act on them. With some effort and concentration, you’ll become a master at promise-keeping, and your friends and family will have greater respect for you and your actions. You were born with a special talent. It may be to sing, write, teach, paint, mentor, preach, defend or befriend. You have something special to offer the world. You must continue to learn and try new things to find your special talent. The world needs your gift. Be aware that even a special talent can go stale if you don’t continue to use it and hone it. Bill FitzPatrick is a 5th-degree Black Belt, holds a Master’s Degree in Education and runs the non-profit American Success Institute at: www.mastersuccess.com. By participating in martial arts, my life has improved. I made new friends and learned to feel good about myself. I know being a Black Belt is to continue to learn something new each day, to set an example to others, to be a leader and to be willing to serve my community. 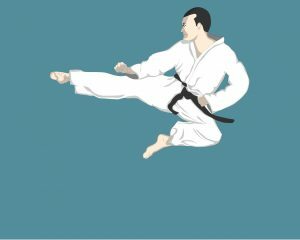 Before I joined my instructor’s Karate studio, I had low confidence and mild depression. When I joined, however, I gained confidence. Previously, I had used my anger and size as my weapon. I did not want to fight, but I was teased and bullied at school. I’ve learned how to eliminate anger as a source of strength, and never to use my techniques in offense, but only in defense, no matter what happens. I now have enough confidence in myself to walk away from a fight. Michael Beckett trains under Sifu Ed G¸ereÒa at Ojai Valley Kenpo Karate in Oak View, California. Health Kick: No Grains or Whole Grains? Many of the latest diets, and even some news reports, proclaim the need to eliminate “carbohydrates” from your diet, but do they really mean to all carbohydrates? Carbohydrate-rich foods include whole grains and fruits as well as pasta, potatoes and sugar. The healthiest choice is to eat whole foods, while incorporating all food groups into your diet. For grains, make sure that your “carbohydrates” are whole grains, and not empty “white” foods. According to a recent survey, most people (86%) agree that eating whole grains is an important part of an overall healthy diet, but 53% reported eating whole grains less than once per day! Only 25% of those surveyed had at least one serving per day. Considering that the current nutrition recommendation for grains is six to 11 servings per day, your personal goal should be to make at least three of them whole grain, if not all of them. Non-whole grain foods (such as white potatoes, regular pasta, white rice and white bread) are devoid of most of the nutrition that grains provide, such as fiber and phytochemicals, while still providing significant empty calories. Avoid mashed potatoes, processed white bread and sugars of all varieties. Choose carbohydrates, composed of whole grains, instead. There are many varieties:†wheat, oats, corn, rye, barley, spelt, groats, wheat berries, millet, flaxseed and brown rice. To make the transition to “whole grain” eating, try some simple substitutions. Mix whole grain pasta with your regular pasta (and eventually replace it completely). Make sandwiches with whole grain or mixed grain bread, or even combine whole grain cereal with a favorite breakfast cereal. Whole-grain eating can be much more interesting than just replacing pastas, breads and breakfast cereal; you can incorporate new grains, or at least new forms of grains, into your diet. Try something new as a side dish or mixed with other dishes. Try whole grain varieties of common foods, such as waffles, crackers, tortillas and breads. As with any dietary change, modifying your whole grain intake will take time. Start with simple substitutions. Add to those some new whole-grain food items and recipes. Your new diet will be more interesting and much healthier.